Charlie Hebdo Magazine, Préts a'rire nan de plus? English: Ready to Laugh for Another Year? Journalist and cartoonist Stéphane Charbonnier (1967-2015) was the publisher of Charlie Hebdo when he was assassinated, along with eleven others, at the magazine’s headquarters on January 7, 2015. 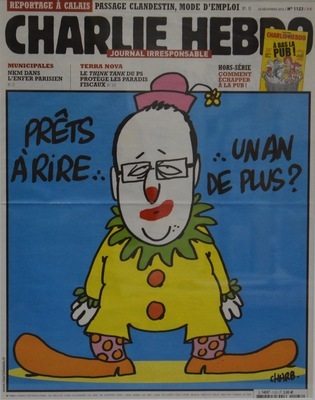 Featured on the cover of Charlie Hebdo on January 24, 2013, Charbonnier’s caricature of French President François Hollande as a clown was undoubtedly inspired by Daumier’s earlier mockery of King Louis- Philippe in Le Caricature.